Did you know that Ballard Designs has a blog? A few days ago, they featured the guys behind Madcap Cottage, a fun and quirky design duo known for their fabulous use of color and pattern. The team, John Loecke and Jason Oliver, used some fabrics from their own fabric line with Robert Allen to upholster some Ballard pieces and they gave some great tips on mixing patterns. It can be tricky (and more than a little daunting) but when it’s done right, mixing patterns is a great way to achieve a collected-over-time look that looks layered and “undecorated” in the best sort of way. These words perfectly sum up my own design philosophy. Fabrics and furnishings can create a lovely backdrop but it’s the layering in of personal pieces that make a space come to life and feel like home. Last week, I mentioned that I was decorating a client’s dining room in blue grasscloth and I shared some gorgeous inspiration photos. Well, here’s the plan! The grasscloth is by Seabrooke. 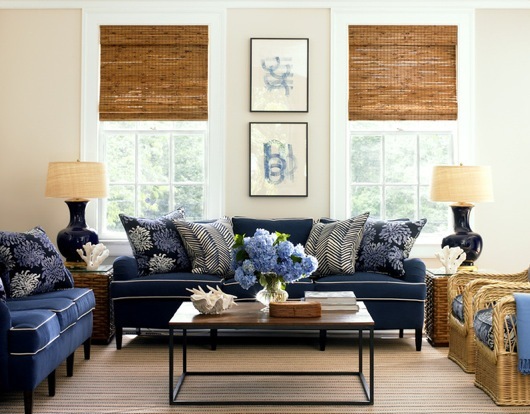 It’s a gorgeous navy and the weave and slight color variations give it so much depth. 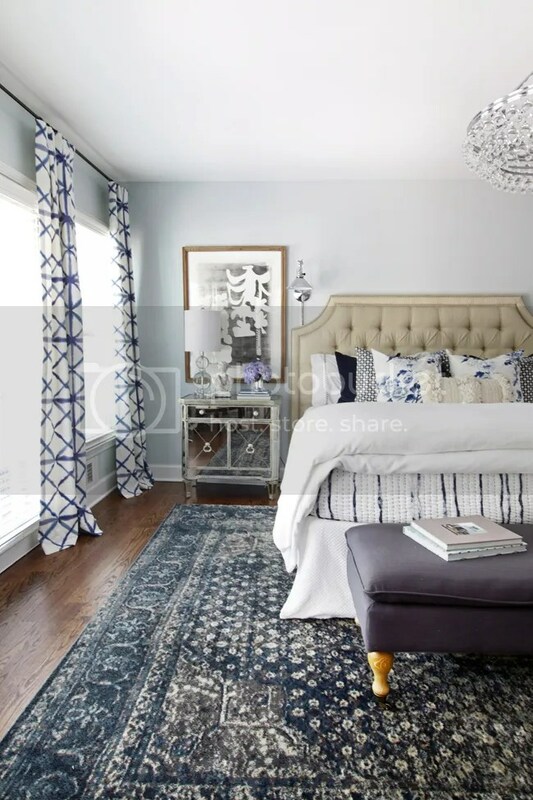 The drapery fabric is Lacefield’s Mubai Indian Blue and it looks gorgeous against the grasscloth. We’ll also add these bamboo shades. I’m custom framing a series of Audubon bird prints from Art.com across the long wall. I love the large scale and realism and their strange, graceful beauty creates a lot of drama. The colors really pop against the navy grasscloth. 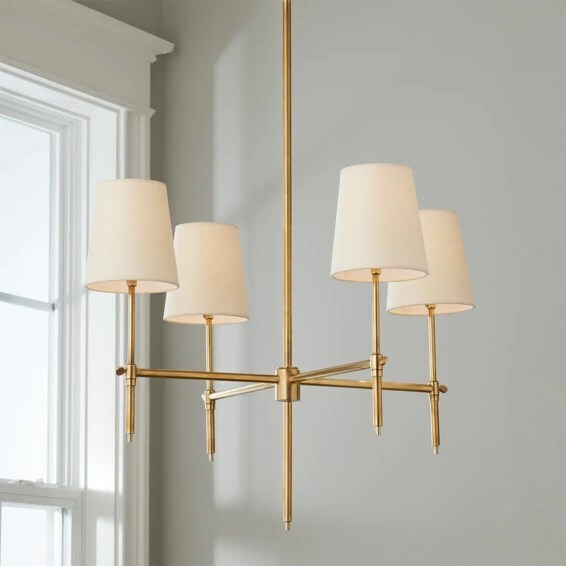 The chandelier is the Soho from Shades of Light in lacquered brass, chosen for it’s simple elegance. The lamp is also from Shades of Light and we’ll be placing it (or something similar, possibly vintage) on the buffet. My client has some chinoiserie pieces in other rooms and I’d like to carry a bit of that over into the dining room. Over the buffet, we’ll install the Rosamund mirror from Ballard Designs in brass. The seagrass rug is also from Ballard. It’s a bargain, I think, at only $399 for a 9×12 and I love the texture it adds. Seagrass is naturally water resistant so it’s a great choice for dining rooms. The client’s dark wood, slightly rustic dining table will stay, but we’ll probably choose new seating to lighten things up. These slipcovered chairs from Pottery Barn will lend a relaxed vibe to the room. The wallpaper will be installed next week. Can’t wait to see the finished space!